Newly Enhanced "MyScript Notes" Software, now available for order with CompAmerica DIGIMEMOs, can recognize charts, graphs and tables drawn by hand and handwriting. It corrects the graphical shapes while accurately converting the embedded handwriting into typed text, instantly producing professional looking presentations in over a dozen languages. CompAmerica's MyScript Notes for Digimemos can be ordered at CompAmerica's main DigiMemo Website or by phone at 888-275-2771. A 30-day free trial edition of this software may be downloaded here. The new product, originally code named "Gizmo", recognizes various shapes drawn by hand along with your handwritten text, notes and captions. It smooths and corrects drawings while converting the handwriting within and surrounding them into accurately typed text. 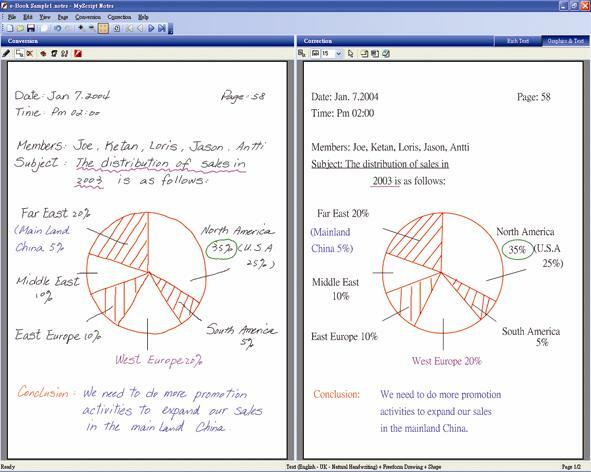 The result: perfectly laid out charts, diagrams and other graphic entities, with neatly typed text around and within them, all just by popping DigiMemo handwritten pages into your Microsoft Windows PC and passing them through the "MyScript Notes" software interface: "voila"! As if that alone were no small miracle: the new software for DigiMemos does so in a dozen (12) languages, and interfaces to PCs using seven different interface languages! 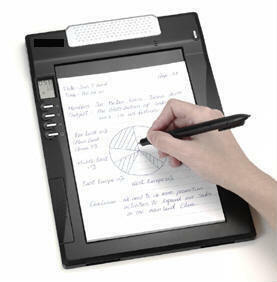 CompAmerica's DigiMemo is adept at capturing handwritten drawings and notes written in pen and ink on a 6x9 inch memo pad surface. A 6x9" memo pad is mounted by inserting it through a slot on the DigiMemo. The DigiMemo stores whatever is written or drawn on the pad surface into a replica file on an integrated Flash Drive. A USB Interface connects the DigiMemo to your PC or Laptop to allow you to access your handwritten pages on your PC for further use, emailing and archiving. DigiMemo pages can be inserted quickly and easily into any Windows Application on your PC which can accept "Cut and Paste" or "Copy and Paste" transfers. The number of such DigiMemo target applications is quite vast, such as Microsoft Office (Word, Power Point, Excel, Publisher), Outlook, Emailer Packages, Web Applications such as Hotmail, Website Builders such as Front Page and Site Builder, Graphical Development programs such as Adobe Acrobat, Quark, Photoshop, Paintshop Pro, MS Paint, Gimp and other applications. The DigiMemo manager software bundled FREE with every DigiMemo, DigiMemos easily lifts, copkies, duplicates, organizes, saves, transfers, colorizes and reviews right on the screen of any Microsoft Windows based PC. The brand new, optional MyScript Notes handwriting translation system turns handwritten text instantly into typed text compatible with most type-based application programs. The graphical content within DigiMemo pages is also automatically smoothed by MyScript Notes. Shapes such as circles, rectangles and so forth are automatically made symmetrical and lines straightend or evenly curved. In only a moment a completed professionally finished presentation emerges. Even though MyScript Notes has been trained by being given thousands and thousands of DigiMemo samples in every language and is highly accurate, some of us have very unique handwriting. No problem! 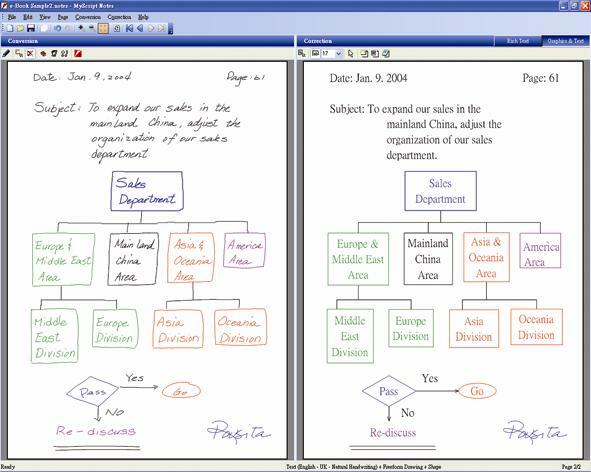 CompAmerica MyScript Notes can also be trained to read your DigiMemos more effectively. Feed it sample handwriting and it will learn from you, more accurately interpreting your handwriting than ever. There's simply nothing as powerful as this elsewhere on the market. DigiMemos can be purchased online for only $95.99 plus shipping/handling, at DigiMemo Website URL or at: Alternate DigiMemo Website URL. This new low, low price represents a major price breakthrough over competing products. "DigiMemos are much lighter than Tablet PCs, have a 100 hour average battery lifespan before replacement, the Pen is designed to be easier to deal with than Tablet PC orbital styluses, for goodness sakes: you write on ordinary paper! And: the DigiMemo weighs only about one pound (1 lb. ), so they are far easier to take with you than about any other pen based digital recording device" added Company Chairman Dr. Shulman. "And for those of you who are lawyers out there, have you reached the strategic limits of your handheld tape recorder, yet? Well, if you're open minded to my thoughts on this subject: I think all of you should really give DigiMemo a try. Believe you me: if you happen to be connected to your laptop and a wireless link to the net, and the need arises: rises... do as I do: fire off a few quick handwritten instructions and email it in a few keystrokes. All without calling attention to exactly what you are doing! Get the jump on the situation!" Dr. Shulman quipped. DigiMemo 6920 Function DiagramPerhaps the most miraculous new invention of the new millennium! Often the most remarkable are entirely overlooked by those who aren't in the know! Digimemo 6920 @ Work!See more information at http://www.digi-memo.com, this is one amazing, yet easy to use product! Simply draw and write on it! MyScript Notes does CHARTS!Hand draw and annotate charts. It's AMAZING, one moment you have the handwritten hand-drawn version, the next: it's been neatly recompiled into a real machine drawn chart with text accurately recognized and converted to typed characters!! MyScript Notes does DIAGRAMS!Hand draw and annotate diagrams. It's AMAZING, one moment you have the handwritten hand-drawn version, the next: it's been neatly recompiled into a real machine drawn diagram with text accurately recognized and converted to typed characters! !